How can we distinguish between the very real and harmful phenomenon of antisemitism, and false accusations of antisemitism used to defend Israeli state policies? Jewish Voice for Peace, a grassroots organization working for justice and equality in Palestine and Israel, has put together a collection of essays on this question, with a foreword by Judith Butler. Order your copy of On Antisemitism today by making a donation to Truthout! 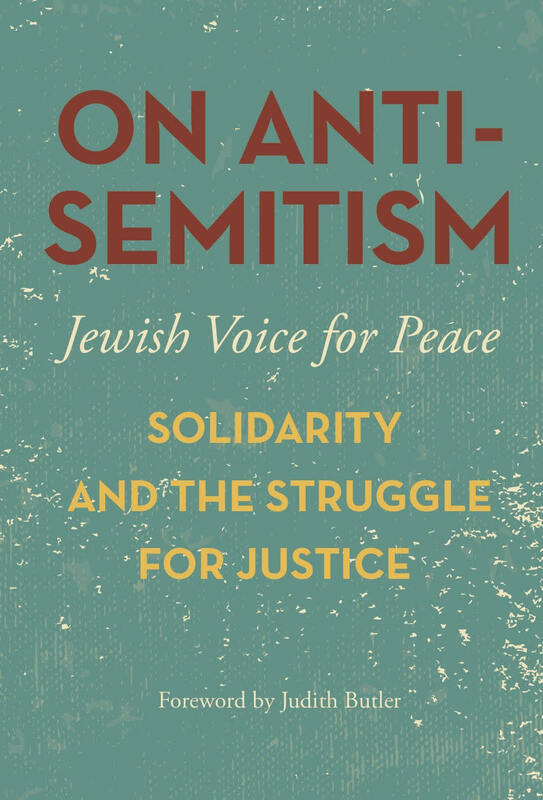 The following is excerpted from the introduction to On Antisemitism: Solidarity and the Struggle for Justice, written by the book’s editor and executive director of Jewish Voice for Peace, Rebecca Vilkomerson. [On Antisemitism] was written in the spring of 2016. Just before it went to press, Donald Trump was elected president of the United States. In the weeks following his election, what has been termed the “alt-right” movement — but is really just another name for white nationalism and supremacy — has moved with startling speed from the very fringes of US discourse to the center of the government. In particular, the early appointment of Steve Bannon, formerly the editor of Breitbart News, to the position of chief strategist in the Trump administration is an indicator that the racism, misogyny, Islamophobia, and antisemitism of the white nationalist movement is gaining proximity to power. Antisemitism is a key tenet of the movement, and in addition to an upsurge in physical attacks and acts of harassment toward Muslims, queers, and people of color in the wake of the election, there has also been an upswing of Nazi-themed graffiti and publicly expressed anti-Jewish sentiment. At the time of this writing, we know very little about the era to come. While the open antisemitism that has emerged is absolutely appalling, we continue to be most urgently concerned by the policies targeting Muslims and immigrants that were a key element of the presidential campaign and are under serious consideration by the new administration. At the same time, the acquiescence and even support for Trump and his appointments by a number of mainstream Jewish institutions is opening a new conversation about how support for Israel and support for Jewish people are not only not equivalent, but sometimes at odds. In fact, a noxious stew of Islamophobia, antisemitism, and racism is emerging that remarkably converges on one point: support for Israel. We hope that this collection will be useful in providing context for not just the current moment, but where we have been and where we are going. Regardless of what happens next, one thing we know for sure: it is the responsibility of all of us to renew our resistance to all forms of bigotry and oppression. In 2004, Jewish Voice for Peace (JVP) self-published a modest volume entitled Reframing Anti-Semitism: Alternative Jewish Perspectives. At that time JVP was a small Bay Area organization, but the question of how to disentangle the actual antisemitism that still exists in the world with the way that accusations of antisemitism are used to suppress the conversation about Palestinian rights was already a challenge. In the years since, while the political conversation about Israel/Palestine has shifted enormously, the questions raised in our earlier book are as relevant as ever. JVP is now an organization with national reach and scope. At the time of this writing, we have sixty-five chapters around the country, over 210,000 online supporters, 300,000 Facebook followers, and 10,000 dues-paying members. We have a Rabbinical Council, an Artist and Cultural Workers Council, an Academic Advisory Council and a Labor Council — providing many different paths into membership in JVP and opportunities for action depending not just on where we live but on our deepest professional and vocational affiliations. We are working in partnership with a Jews of Color/Mizrahi and Sephardi Caucus, which is leading us in confronting the ways in which we have not dealt with issues of racism, internal oppression, Ashkenazi dominance, and the erasure of the Mizrahi/Sephardi experiences inside JVP and in the Jewish community more generally. In short, we have a new commitment to create a community that is a true reflection of the reality of who makes up the Jewish community. We are struggling toward a new model for a Jewish institution in this country — one where we strive to be a place where you can bring your whole self. Several members of the councils and chapters as well as the above mentioned caucus are represented in this book. When our first book was published, the Palestinian call for global solidarity through Boycott, Divestment and Sanctions (BDS) had not yet emerged, let alone gained the strength, victories, and mass support that it has today. And in the past few years the latest manifestation of the struggle for Black lives in this country has renewed the discourse about white supremacy and the intersectionality of struggles for justice in our own country and around the world. But in the same period, perhaps in response to the growing strength of the movement for Palestinian rights, there have been increasing efforts by those that unconditionally defend Israel to include criticism of Israel as part of the definition of antisemitism. Dubbed the “new antisemitism,” it defines Israel as the “Jew among nations” in order to shield it from criticism, and has gained broad acceptance in the intervening years, leading to a dangerous blurring of lines that equates criticizing the actions of a state, Israel, with hatred of Jewish people. So while much has changed, much is still the same. On campuses, in churches debating divestment, and in our own communities the same quandaries are still in play: how to talk productively about antisemitism when so often the accusation of antisemitism is used as a cudgel to repress substantive discussion, and whether criticizing Israel is antisemitic. This new volume aims to offer something new in response to the current moment. It includes a multiplicity of Jewish experiences in the United States, and also looks at antisemitism from beyond the Jewish perspective, including how antisemitism and accusations of antisemitism affect other movements. And for the first time, we are offering our own definition of antisemitism. For too long, many of us have been reluctant to dive into the debate about how to distinguish true antisemitism from criticisms of Zionism or Israel. Accepting that frame of the debate in itself seemed to endorse a fundamental suspicion of the movement for Palestinian rights that is neither called for nor appropriate. We also felt strongly that the endless debates about the definition of antisemitism would detract from necessary attention to the state-sponsored systemic violence and structural power of Islamophobia, anti-Black and anti-immigrant sentiment, and all forms of prejudice and bigotry that demand our immediate and sustained attention. But by doing so, we realized we were allowing a definition of antisemitism to prevail that can shield Jews — especially those with white or class privilege — from examining our own roles in oppression in the United States and in Israel/Palestine, is often used to justify or excuse Israeli human rights abuses, and that intimidates and silences people who aren’t Jewish from speaking out on one of the most pressing issues of our time. We hope that with this book we are offering an effective tool for serious consideration of antisemitism in its proper context. Of course, that does not mean that the pieces in the book are in lock step. This collection has a definite point of view: each author who contributed takes as a starting point that fighting for Palestinian rights is part of the framework of our commitment to justice. But that being said, there is dialogue and tension among the pieces, including contrasting approaches and conclusions that we hope will make the public discussion of antisemitism and related topics both richer and deeper. One thing that comes through loud and clear in several of the chapters, especially those not written by Jews, is the extraordinary fear of being called antisemitic, and just how damaging that accusation can be, so much so that there is one glaring omission in this collection: despite the enormous amount of activity on campuses, the Palestinian students we asked felt they could not run the risk of harassment and retaliation if they publicly described the firsthand experience of what it is like to be a Palestinian student accused of antisemitism. Not only is the collection the poorer for it, but it is a sobering reminder of what is at stake in these discussions — for Jews and non-Jews alike. Facing the dangerous reality of antisemitism and the false accusations used to defend Israel’s policies. We hope that this collection will be of value to multiple audiences. It is certainly for those who may be new to this issue and are grappling with these questions for the first time, or who may be interested in what people active in the movement for justice in Palestine think about antisemitism. But most of all this book is for our movement — our members, our allies, our partners — everyone who takes as their core principles that equality, freedom, and human rights are for everyone. It is an exhortation not to give up the fight — to take antisemitism seriously as part of a movement for justice but also to have real open conversations about what it is and what it is not, to break through fear, silence, and the hegemony of the approach to antisemitism in this country. It is for everyone who works so tirelessly and bravely, whether in the face of their own communities’ opprobrium or in the face of fear of state repression. Copyright (2017) by Jewish Voice for Peace. Not to be reprinted without permission of the publisher, Haymarket Books. Rebecca Vilkomerson is the executive director for Jewish Voice for Peace.